It's been a while since my last post, so I can't believe we are in September now. Where DOES the time go? As the summer has been quite busy, I 've been feeling the need for a little pampering. Today, I decided to have an impromptu pampering facial treatment at home. The products I chose are ideal for combination normal skin, sensitive skin and even for dehydrated skin (nice that I am all of these :) ). A pampering treatment to help you relax doesn't require a multitude of steps or a great deal of time, just a few quality skin care products to help put you at ease. The Hale & Hush product line is one I've been using since Spring and I really am a fan because it's specifically created for those with sensitive skin (eh hmm, me). I first learned of them in a class for skin care for cancer patients undergoing chemotherapy. Their Quiet Wash uses ingredients such as Mirabilis Jalapa Extract, Moringa Pterygosperma Seed Extract and Epilobium Angustifolium Extract, which all work together in supporting skin barrier function, improving hydration, reducing inflammation, irritation and soothing skin. Sounds pretty wonderful right? Just a small pea sized drop was enough to gently cleanse my skin without making it dry, and honestly made it feel pretty nice and clean. It rinses off easily and doesn't leave any residue. My next easy step was to squeeze a small pea sized amount of Acure Organics Brightening Facial Scrub for a gentle exfoliation. I really like that it includes many antioxidant fruit extracts, along with calming ingredients like aloe, calendula and chamomile. The fact that it contains kaolin clay actually doesnt dehydrate much and although it is considered a physical scrub, I really like the fact that someone like me with blotchy skin and redness can still use it. Of course I use a tiny amount as well as being quite careful to avoid scrubbing too vigorously...slow circular motions does the trick. As this IS a pampering treatment, I had to include Laurel Whole Plant Organics' Almond Grain Exfoliant. 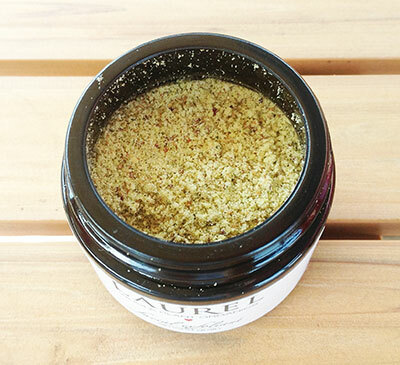 This exfoliant can be used as both a physical scrub exfoliant or as a mask. One of my favs is that this product smells so darn good. Immediately, the honey like floral essence hypnotizes me and puts me into a calm trance. If it were a food item, I would definitely want to eat it! After mixing the product with equal parts water, I apply it to my face like a mask. Seeing the tiny bits of botanicals (chamomile, marshmallow, nettle) makes applying it fun and interesting. One can even smell the mask while it's on which really adds to the whole spa pampering experience. After 15 mins, I rinsed the product off in the sink with cool water and gently pat my skin dry. Last but not least, the perfect finish to my luxurious treatment was Hale & Hush's Soothe Essence Serum. 4-5 small pumps of this amazing serum hydrated my skin. Since I was not applying a moisturizer after the serum, I used an extra 2 drops of serum to keep my skin moist. Otherwise, I would use less serum and apply moisturizer afterwards (in instances like if I needed to apply sunblock + makeup). The ingredients in this serum work together to soothe, add moisture and plump the skin by drawing water in. After the last step of serum, my face felt very soft, smooth and supple. I ended with some final tapping movements on the skin. Tapping also known as tapotement or percussion is a form of massage. Do you remember when receiving a facial, the therapist would perform light tapping or finger movements on the skin? This is tapotement. Massaging the facial skin can bring about overall relaxation and relaxation of facial muscles, it can stimulate blood and lymph circulation, activate sluggish skin and improve muscle tone. I like to "tap" my skin to also improve product absorption, as in this final step after applying serum. As I finish writing this post, it's been several hours later after my lovely treatment and my face feels really soft and supple still. Any dry patches have been sloughed off, hydrated and I am feeling pretty happy and relaxed. Yay!!! 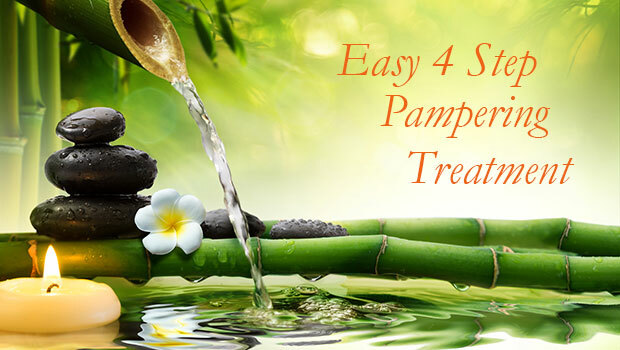 What is your easy pampering do at home treatment that helps you relax and feel as if you're in the spa?